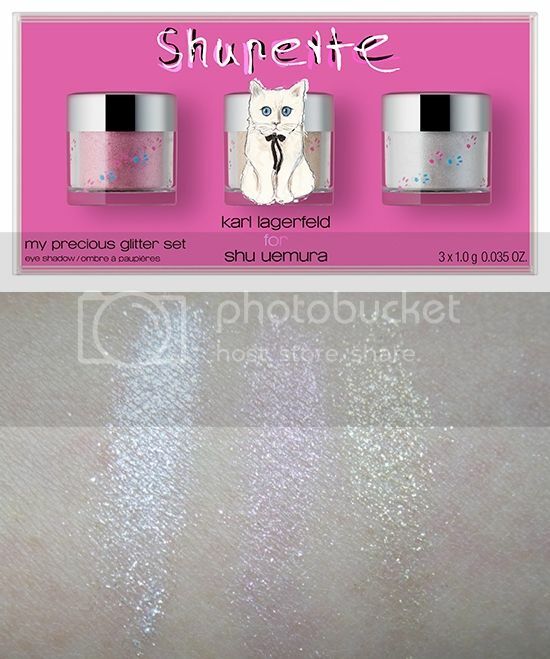 Karl Lagerfeld for Shu Uemura: Shupette’s Holiday Makeup Collection! 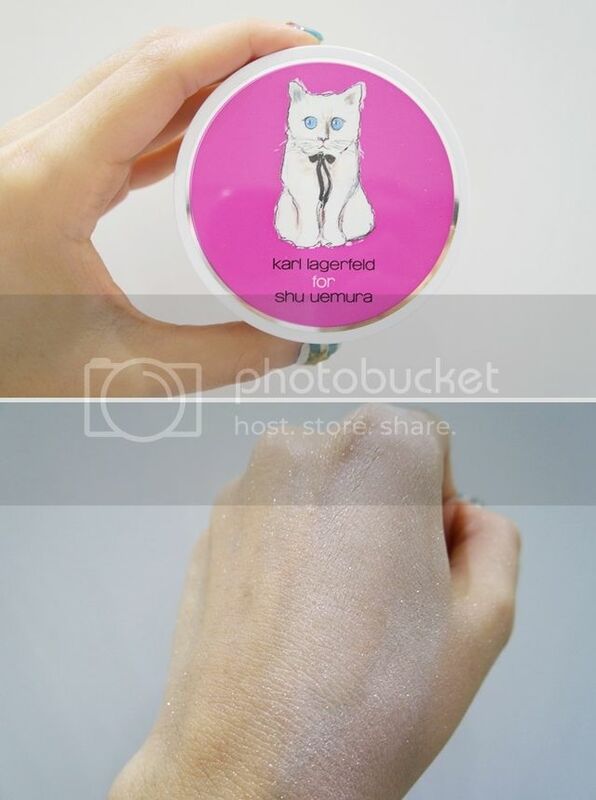 The Shupette Holiday 2014 collection by Shu Uemura x Karl Lagerfeld contains 20 gorgeous beauty products and although I do not own every single one of them, I do have swatches! I’ll get started with the prettiest palette one can ever own (esp if you love your kitties)! 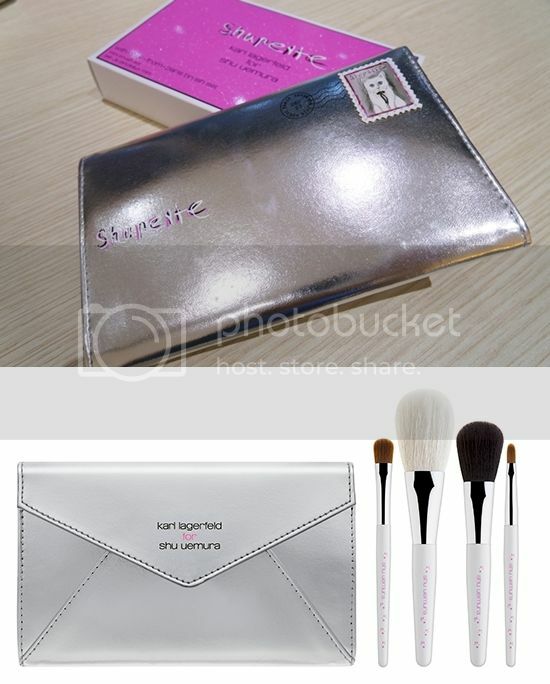 As seen in the first pic, it comes with a fluffy white pouch with blue embellished eyes like Choupette’s and for the palette, it has a shiny mirror cover featuring the ultra cute Choupette of course. 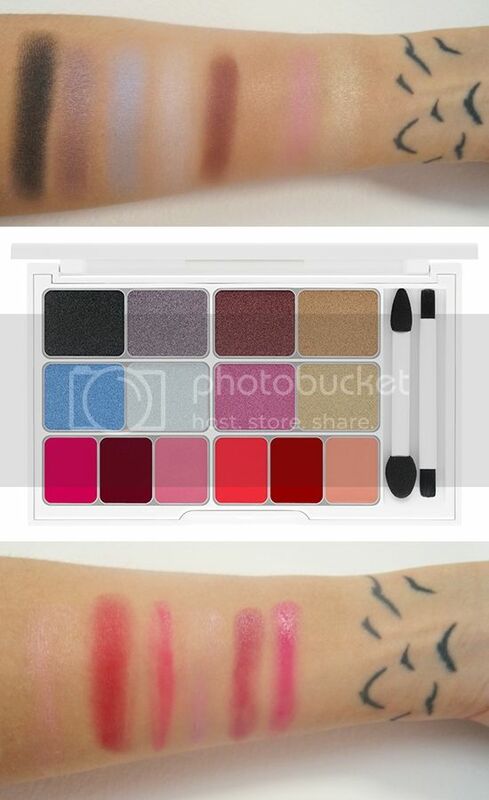 This palette contains 8 full-sized eyeshadows in varying shades from black, dark gray, burgundy brown, toffee, pastel blue (aka Shupette Blue), cool gray, rose and light beige. If you’re not brilliant in mixing eye colors, like me, you can break them down to two distinct quads – left four for the blues vs right four for the pinks. If you would like the color playoff to be more intense, it would be recommended to apply eye primer beforehand as the pigmentation are not crazy intense for a softer cat eye look. Accompanying the eyeshadows are a dual-ended sponge-tip brush and synthetic bristle lip brush along with 6 lip colors with both cool and warm tones such as magenta, violet, pale pink, salmon pink, deep red and baby pink (swatches from right to left). The eyeshadow trios comes in a portable, kawaii casing that holds 3 pressed eyeshadows, each to achieve a unique kitty eye. 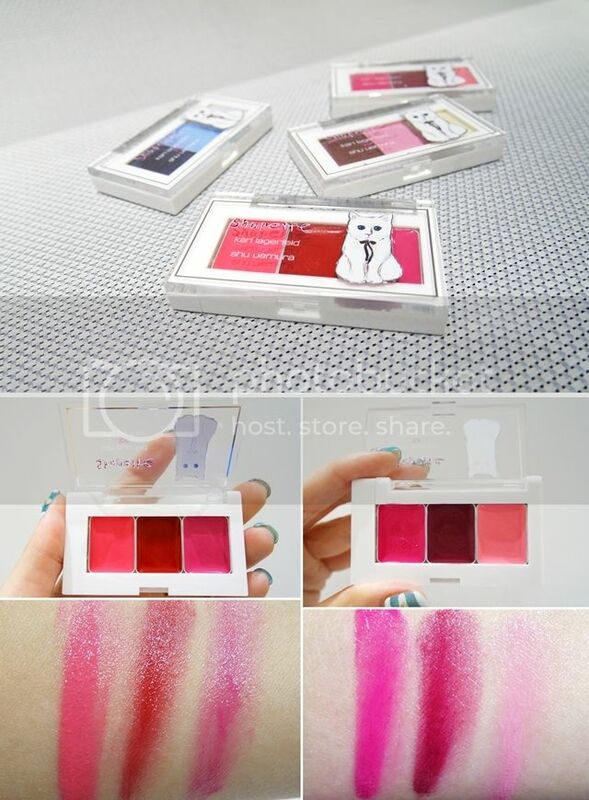 Paw on #01 for parisienne chic look (top) that includes the gorgeous Shupette Blue or #02 for tokyo kawaii look to get the cute and bright cat eye look! More gorgeous trio palettes for you, Shupette’s vivid candy color pay-off and luminous finishing for your lips using Shu Uemura’s innovative Lumicolor Matrix Technology. #01 for the parisienne chic look (right) & #02 for the tokyo kawaii look (left) to complement the shades for Eye Need Shu Eyeshadow Trio, or a handy pop of color choices to jazz up your everyday look.. your pick! This addictive marshmallow-like texture is pretty amazing to touch! 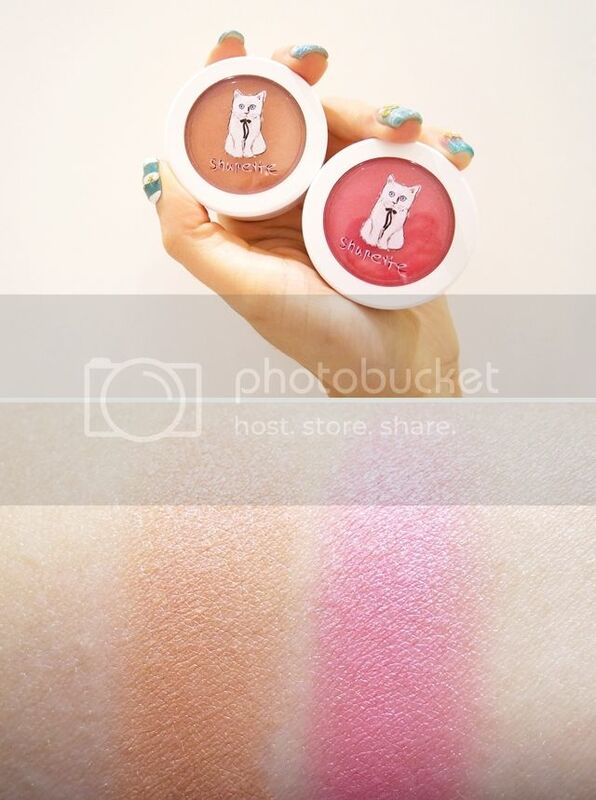 The texture is powdery and creamy with subtle color payoff, it feels like powder yet stay on the skin like cream. The gorgeous Shupette decorated case easily helps identify the 2 shades available: pink & orange. 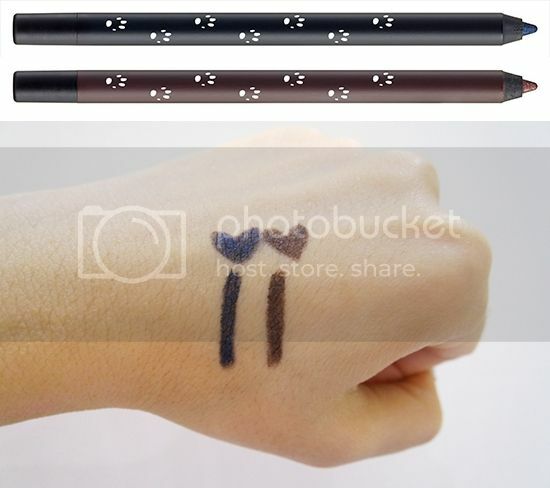 The liner pencil comes in 2 colors, Midnight Black & Gala Brown, this was easily my favorite item of the entire collection (since I’m an eyeliner fine) as I am amazed by how smudge-proof and long-lasting it actually is! A creamy and smooth texture with Shupette Blue Pearl in Midnight Black and Pink & Gold Pearl in Gala Brown, it brings a unique touch when I filled it in my lashes. Another favorite of mine in this collection is this glitter set that features 3 colors in a set – pink, gold, silver. And to be honest, I feel that my swatch does not do justice to this loose powder glitter trio :/ They are super sparkly irl and I can only imagine the amount of dazzling fun it adds to this upcoming festive season of non-stop parties and celebrations! 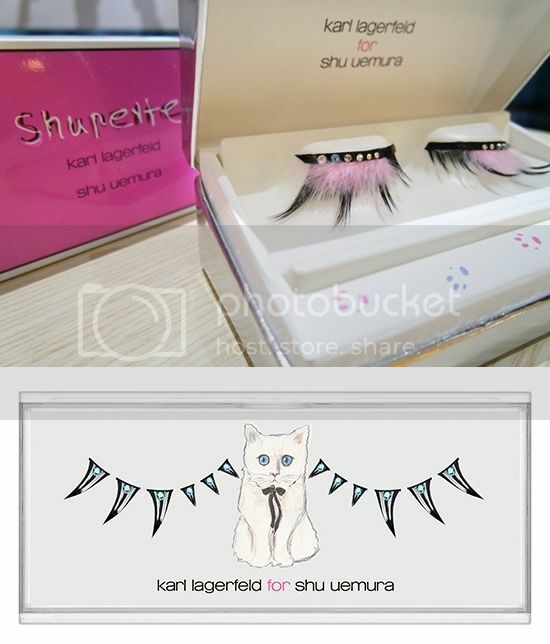 No Shu Uemura collection is complete without their signature luxurious falsies in the most unique design ever. You can choose between the Furry Fantasy haute-couture eyelash in a sleek metallic sliver box (with elegant pink feather and a hint of Shupette-blue crystal) or Eye-Need-Shu partial accent lashes (with metallic silver highlights and Shupette-blue crystals), or both for the perfect kitty eyes! 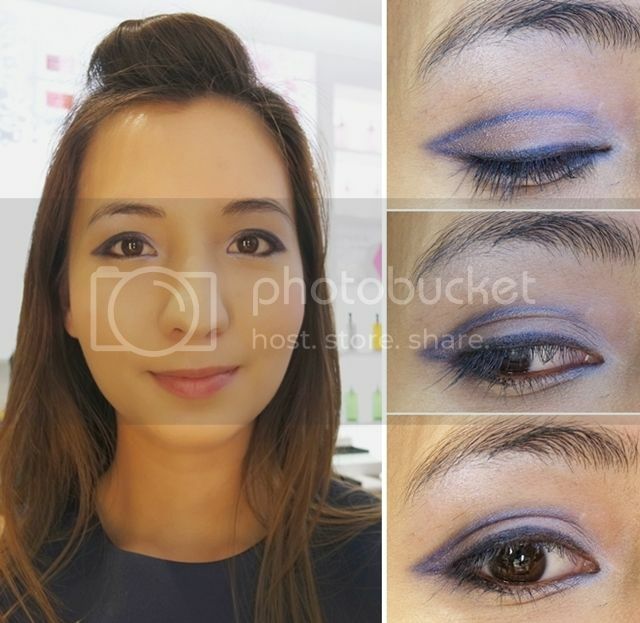 Here’s ending off with a Parisienne Chic Cat Eye #motd c/o Shu Uemura’s Accredited Makeup Artist, Sophia Chia!